Remember that scene in Annie Hall? Every time I encounter an IHFB I cringe and think of this scene. I’ve done my share of cinematic pontification and it wasn’t until I started to encounter several incarnations of Man in Theatre Line all over Los Angeles, that I decided to keep my brilliant analytical insights to myself for fear that I might sound like an annoying IHFB. Thinking it’d be less annoying than verbalizing my opinions, I started to write reviews for an e-zine. At first it worked. It was much easier to send a link to a review when someone asked what I thought about a movie. But then I started to annoy and bore myself with the written version of my gushing, passionate pontification and parading of my vast film knowledge. It was also truly traumatizing to have to pan some of my favorite directors (including Woody) in the name of journalistic integrity and to fend off angry and offended moviegoers because my tastes were not populist and differed from theirs. Tell someone you hated the beloved Haggis’ Crash and Slumdog Millionaire and you might find yourself the victim of mainstream ire. A few people said they had not seen Lawrence of Arabia and I asked if they had seen The Bridge on the River Kwai. They said yes and before I could complete my thought the IHFB interrupted with “Oh no. But Lawrence of Arabia is much more factual.” I turned around and gave up on the conversation. The IHFB continued to spill out tomes and tomes of David Lean and Lawrence of Arabia information and analysis hardly letting anyone else from the group chime in. I had to sit through 20 minutes of that before my friends, who were driving all the way from San Diego for this special screening, arrived. I decided right there and then to pretend I knew nothing about film. When asked my opinion, I'll just say I liked it, didn't like it, or it was okay. That was to be my gift to my fellow humans. And this is how one gets to learn the true meaning of empathy folks. Ok, so this post was supposed to be about the incredible experience that is Lawrence of Arabia on the big screen. It made me sad that $500 million had to be spent to make blue lizards on 3-D to “restore the wonder” to the movie going experience, when all you have to do is spend $10 at your local revival/arthouse theater. Oh what the masses are missing! 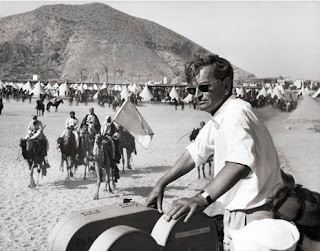 Would David Lean have used CGI instead of spending two years in the desert if the technology had been available to him?